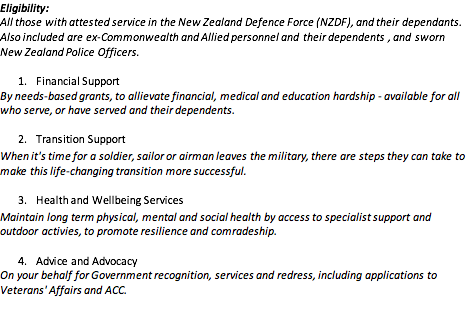 By needs-based grants, to allievate financial, medical and education hardship – available for all who serve, or have served and their dependents. When it’s time for a soldier, sailor or airman leaves the military, there are steps they can take to make this life-changing transition more successful. Maintain long term physical, mental and social health by access to specialist support and outdoor activies, to promote resilience and comradeship. 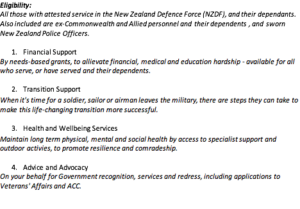 On your behalf for Government recognition, services and redress, including applications to Veterans’ Affairs and ACC. Click here for information on adventure activies. All those with attested service in the New Zealand Defence Force (NZDF), and their dependants. Also included are ex-Commonwealth and Allied personnel and their dependents , and sworn New Zealand Police Officers.